Now for my cancer update. It's going great, honestly - my scans have all showed nothing new and my tumour markers have stayed pretty much steady. At my most recent oncology appointment this past Monday, my oncologist and I decided that I would see her every six months instead of every three just because everything is so stable. I'll see her next about two weeks after my scans in August, which will be around seven months or so instead of six but I think that will be fine. Of course if I notice anything unusual, I'll call for an appointment. She said that my metastatic cancer is oligometastasis because just one organ (in this case one bone) is affected. They're starting to discover that people who have oligometastasis can receive curative treatment and live for many years after diagnosis. I'm thrilled, of course! This is wonderful news. At the same time, I do feel sort of weird about it. I have a friend who is not doing well (they're talking about months instead of years left for her) and lots of other friends who also aren't doing well... along with a ton of other friends who have died. They're going through so much with treatments and whatnot and I'm just not going through all that. I feel like I don't fit in with people who have metastatic breast cancer because things are just going so well for me. 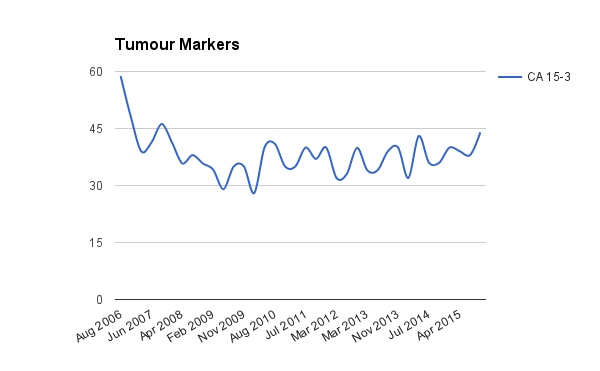 I've made a chart of my CA 15-3 tumour markers from the beginning; they're still oscillating in a fairly narrow range. So there you have it; cancer-wise, things are awesome right now!